Classical at the Freight brings in the Bay Area's best classical musicians for an hour of outstanding chamber music in an informal, friendly atmosphere. San Francisco Chamber Orchestra music director Ben Simon hosts. There's no stuffiness, no mystification, just an invigorating evening with gifted musicians sharing the beauty and joy of this timeless art with new audiences young and old. 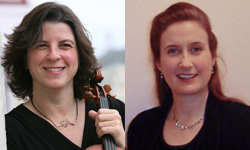 Tonight brings a rare opportunity to hear the SFCO's elegant and impassioned concertmaster, Robin Sharp, in recital with her Stanford University colleague, pianist Laura Dahl, playing the music of Johannes Brahms, Amy Beach, and Ernest Boulanger. Robin served as concertmaster of the Berkeley Symphony with Kent Nagano for six seasons and is currently a solo performer, chamber musician, and concertmaster of SFCO, as well as teaching both privately and at Stanford. Laura is a founding member of the Harmida Piano Trio and is also the founder and artistic director of the A. Jess Shenson Recital Series at Stanford and the Music by the Mountain festival in northern California.